The City of Oakland would not spend any public money on constructing a new ballpark in Jack London Square for the Oakland A’s, but would assemble land and provide infrastructure and parking for the stadium, Mayor Ron Dellums said at a City Hall press conference this afternoon. Dellums and city staffers said the city would use redevelopment funds to acquire property, and not the city’s debt-ridden general fund, and hoped to obtain more federal stimulus money for infrastructure if the project goes forward. As we’ve seen before, land and infrastructure and parking can add up to a hefty chunk of change, especially in downtown locations like Oakland is considering, where land costs for both the stadium and accompanying garages are likely to be high. Also, add this to the list of sports projects seeking federal stimulus subsidies — not that stadium building doesn’t create construction jobs, but if you’re going to put people to work just to get them work, you’d kind of hope they’d have a bit more public benefit. Finally, if you had any doubt that stadium-chasing is a phenomenon that affects local elected officials across the political spectrum, the fact that friggin’ Ron Dellums is advocating public spending on behalf of a private sports team should make things eminently clear. The New England Patriots footbridge controversy widens today, as the Boston Globe reveals that Pats owner Robert Kraft gave $12,000 in campaign contributions to Gov. Deval Patrick at the same time that Patrick was backing a plan to give $9 million in federal stimulus money to the bridge project. In other stimulus-subsidy news, meanwhile, the Kalamazoo County commission met Wednesday to debate whether to build an $81 million downtown arena for the Kalamazoo Wings, which could use federal stimulus bonds to pay part of the cost. Commissioners were split on the proposal, but are going to keep investigating it. It looks like we may have a winner for first stadium-related project funded with federal stimulus dollars: The state of Massachusetts is moving ahead with a plan to spend $9 million in stimulus money on a footbridge between two parking lots that serve the New England Patriots‘ Gillette Stadium. If the bridge funding gets final approval from a regional planning board later this month, it will beat out a slew of other projects that have been rumored to be considered using stimulus money: an arena in Kalamazoo, the Columbus Blue Jackets‘ arena, a minor-league baseball stadium in Illinois, etc. Most of these would use subsidized federal bonds approved under the stimulus bill — the Pats seem to be the only ones looking to funnel stimulus cash directly into stadium-related construction. Of course, if the Kraft family is interested enough in developing the parking lot that they’d build the bridge themselves, then the “increase” in private job creation from the subsidy is zero. Or if they’d build it with a smaller subsidy, then the same holds true for the excess subsidy amount. And there’s no guarantee the development will even get built, or if it does that it won’t just cannibalize commercial jobs from elsewhere in Massachusetts. I’m never going to get hired as a secretary of economic development, am I? As I was afraid of, It looks like more teams are going to be following the New Jersey Nets‘ lead and trying to get a piece of states’ federal stimulus funding for their stadium or arena projects. The Minnesota Vikings are pushing their $954 million stadium plan as “a significant jobs and economic stimulus package,” while a developer in Sparks, Nevada, is arguing that an arena is “shovel-ready.” Legislators in both states sounded skeptical — Nevada assemblymember Debbie Smith, who represents Sparks, told the Las Vegas Sun, “I just can’t picture how the general public would think that is the best way to spend our stimulus money” — but hope springs eternal in the stadium game. Atlantic Yards Report’s Norman Oder, the hardest-working blogger in show business, reports that the final version of the federal stimulus bill deleted a proposed ban on stimulus money going to sports stadiums. The amendment, originally introduced by Republican Sen. Tom Coburn, would have barred any use of funds “for any casino or other gambling establishment, aquarium, zoo, golf course, swimming pool, stadium, community park, museum, theater, art center, and highway beautification project.” In the final language, parks, museyms, theaters, art centers, highway beautification, and stadiums were all stripped from the section, though Coburn’s hatred of publicly funded zoos still made it into law. 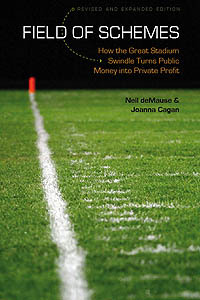 This still doesn’t necessarily mean a gold rush for sports teams to cash in on stimulus funds by declaring their projects “shovel-ready”: The legislation still restricts funding to certain areas, like transportation or public housing, though there is a worryingly vague provision for “other government services.” Lobbyists are probably Blackberrying frantically right now to figure out how wide they can force this loophole open; you think Al D’Amato types in ALL CAPS when he’s excited? Should the project turn out to be eligible to get money, it would require a major political step by Mr. Paterson to allocate the relatively scarce stimulus money. The project has always been a political hornet’s nest, and to date, neither Mr. Paterson nor his predecessor Eliot Spitzer have had to take any overt, highly public steps in support of it. Given that there are far more projects than there is stimulus funding, it’s safe to say that money to Atlantic Yards would come at the expense of some other project in the area. If eligible, the question then becomes whether or not Bruce Ratner, Al D’Amato, supportive politicians and groups could push Atlantic Yards toward the top of the stack at the same time that other politicans are fighting for projects of their own favor. The sullen economy and tight credit markets have made it difficult for teams and municipalities to borrow money to fund projects, which in effect has everybody in the facilities industry searching for answers…. Teams and facility developers acknowledge that sports takes a back seat to the dramatic fallout in other business sectors. However, they are encouraged with President-elect Barack Obama’s push for public infrastructure improvements across the country, developments they feel could create momentum for their own projects. That makes about as much sense as most things Samson has said, but it’s still worrisome that the meme of a sports bailout seems to be picking up speed. The Phoenix Coyotes, meanwhile, are apparently still trying to recoup the $2.70-a-ticket surcharge that is the only revenue the city of Glendale gets in exchange for putting up $180 million of the $220 million cost of the team’s arena. (Rent? A share of arena revenues? Get real!) With the Coyotes leveraged up to their ears in debt, though, and hockey commentators openly talking about the team folding, they may actually get a hearing for throwing good public money after bad. To cover those escalating salaries, owners needed new revenue. Since hockey was an arena-based gate-receipts business – as it always has been and continues to be – the owners found that they needed more seats, more amenities, more luxury boxes and, yes, even better parking revenue. Many owners got those things. Not all did. Norman Green, the North Stars owner, issued the ultimatum and was the first to make good on it, in 1993. Unable to coerce a new deal out of the Twin Cities (and with his local mall business failing and facing a sexual harassment suit in the Minnesota courts), he packed up his team and headed to Dallas. Other teams followed, each with their own local twists, turns and absurdities. In the case of the Jets/Coyotes, there was political wrangling galore and ever-shifting demands from the Jets owners, led by Winnipegger Barry Shenkarow. The public, some politicians and some in the business community exhausted all avenues to save the Jets. But the civic and commercial forces in Winnipeg could not make it work, and perhaps Shenkarow would never have relented anyway. The problem with this argument is that even with “more seats, more amenities, more luxury boxes,” most new arenas wouldn’t have made money overall – if not for government subsidies so that the teams could reap the benefits of those new amenities without worrying their little heads about construction debt. The NHL’s shift southward, then, has less to do with greedy players or with Sun Belt colonialism than with the fact that unlike Canada, U.S. cities were willing and ready to build lavish new facilities with public money. For no compensation beyond a piddly $2.70 per ticket. With the state and federal governments looking for ways to jump-start the economy, a New Jersey businessman has an ambitious public works project he says will create more than 5,500 jobs and provide $500 million or more to local contractors. The businessman is Zygi Wilf, principal owner of the Minnesota Vikings.